CACI works by combining a unique patented waveform (Tsunami), with the naturally occurring bio-electric current of the body, to achieve instantly visible results on sagging muscles and skin tissue. CACI gently helps tighten and tone sagging muscles whilst smoothing the appearance of fine lines and wrinkles. 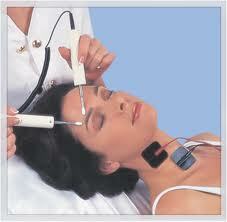 The dual tipped probes increase the effect on the muscle producing immediate and dramatic results. A feature of CACI is the simultaneous use of pads and probes. These target both the face and neck area at the same time, making for a doubly effective treatment. The CACI treatment programme consists of a course of deeply relaxing treatment sessions, followed by a maintenance programme of just 8 to 10 CACI treatments each year. Courses are available at specially reducedprices, which could save you money if you are considering ongoing treatments.